Over the past few weeks, Indonesia and Singapore have held this year’s iteration of a longstanding air force exercise. While the drill itself is a routine affair, the development nonetheless put the spotlight on a key engagement on the defense side of the relationship between the two countries. While the security relationship between Indonesia, Southeast Asia’s largest state, and Singapore, the region’s smallest, has tended to be prickly historically speaking, the two countries have nonetheless maintained a cordial defense relationship. That relationship includes the usual components, including visits, exchanges, and exercises, with collaboration across several areas such as counterterrorism, maritime security, and the development of wider minilateral and multilateral mechanisms in Southeast Asia and beyond. That has continued on into 2018 as well. Indeed, this year has seen not only the continuation of certain elements of the defense relationship, but also some selective expansion, including in counterterrorism which has been a rising concern for both Indonesia and Singapore. Cases in point include the incorporation of a maritime counterterrorism serial into their bilateral naval exercise Eagle Indopura held in April, as well as the development of the Indonesia-initiated ‘Our Eyes’ intelligence-sharing mechanism which has been expanded to include several other countries as well. This has occurred as Singapore has been serving as chair of the Association of Southeast Asian Nations (ASEAN). One of the engagements between the two sides on the defense side is Exercise Elang Indopura. The exercise, which was initially inaugurated in 1980, has since grown larger and more complex over time in terms of the assets that are deployed and the nature of the scenarios that are embedded within them. The 20th iteration of this exercise was held in both Singapore as well as in Indonesia. This iteration of Exercise Elang Indopura comprised two phases: a command post exercise, held at Paya Lebar Air Base in Singapore from November 7 to 9, and an air maneuvering exercise, which was conducted at Roesmin Nurjadin Air Force Base in Indonesia from December 4 to 17. According to Singapore’s defense ministry (MINDEF), more than 150 personnel from both air forces participated in this iteration of the exercise. 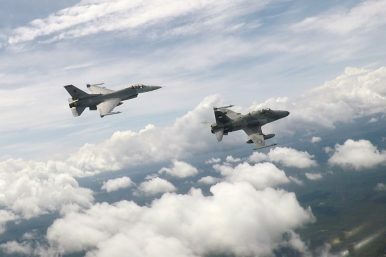 Asset-wise, a total of 16 fighter aircraft were part of the exercise this time around, including the RSAF’s F-16C and the TNI AU’s F-16A/B and Hawk 109/209.